I've been a bit grump of late and it has been suggested that this might be due to lack of sleep. Having a 5 month baby and an early rising (almost) 4 year old means that I don't have a lot of time to lie around in bed catching Zzzz's so when I do put my head on the pillow I need to get to sleep straight away. This is maybe why over the years I have developed a bit of a pillow obsession. To be honest it's less of a pillow obsession, more of a 'buy lots to find the perfect one' obsession. I've always struggled to find a comfy one and I have been known to spend quite a lot of money on all different varieties - memory foam, feather, synthetic, goose down. 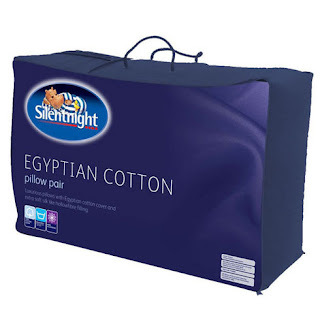 You name it, I've tried it - so when I was contacted by Silentnight beds and offered a pack of 2 Egyptian Cotton Premium Pillows, I immediately accepted (and Chris was happy too because usually I just buy one pillow for myself!) I know - how mean am I? The pillows arrived and I immediately swapped my old pillow for the nice new one - selfishly leaving the other safely tucked away. It felt really nice, soft but supportive. Sometimes pillows can be 'too stuffed' and can leave you with a stiff neck in the morning but this one left me feeling, well... normal. No aching neck - just a great night's sleep. After a couple of days I had completely forgotten that I had only added one of the pillows to the bed and when I went to bed a little later than Chris one night my pillow had been stolen and he was happily snoring away on it. I was fuming! I had to scramble around in the dark to find the other pillow that I'd stashed. We were both woken up to a small child jumping on the bed the next morning but after a good nights sleep we weren't as grumpy as usual. A month on we're still enjoying our pillows but our mattress now needs updating due to constant early morning bouncing . I'm hoping to go look at some news beds this weekend but Chris says we should just buy a new mattress - I WILL get my own way!